Le Cundaro a été construit autour d'un magnifique jardin intérieur. Toutes les chambres présentent un décor traditionnel et disposent d'une connexion Wi-Fi et d'une télévision par satellite. Les appartements comprennent un coin salon et une cuisine avec plaque de cuisson, four micro-ondes et réfrigérateur. Le Casa Cundaro propose également des soins et des massages et met à votre disposition un service de location de vélos. Le linge de toilette est fourni gratuitement et vous pourrez bénéficier du service de nettoyage. Le Cundaro se trouve à environ 100 mètres du Musée d'Histoire de la Ville et de l'Église Saint Feliu. L'aéroport de Gérone est à 25 minutes de route. Un service de navette est proposé au départ de la gare de Gérone, à environ 1,3 km de l'hôtel. Charme de l'appartement avec vieilles pierres . Possibilité de manger a l'appartement . Proximité du cœur historique de gerone . Équipement un peu insuffisant dans la cuisine . La situation, la beauté des lieux la tranquillité. Maison de caractère à deux pas de la cathédrale. Très grands chambres. Accueil professionnel à l'hôtel Historic proche. Modernste Dusche aber kaltes Wasser. l'emplacement et le charme de l'hotel. le chauffage en pleine ete dans la chambre et la chambre sans clim pour 120 euros la nuit! Emplacement touristiquement idéal, maison ancienne magnifique. Superb location, right in the heart of the old town. Tiene un cementerio en la otra parte de la carretera enfrente. La sensació de casa antiga amb tot el caràcter del call ben acondicionada com apartaments. La ubicació de la casa al bell mig del barri jueu.Que l'habitació fos un petit apartament molt ben equipat i funcional. Costa una mica trobar la casa si no coneixes Girona. Esta n un edificio del siglo VIII excelentemente cuidado. Al lado de la catedral. La oficina para check in es en otro hotel muy cerca de ahí. El personal muy atento. Súper limpio y wifi funciona excelente. Muy buena relación calidad precio. 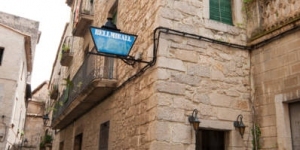 Stay at the heart of the Jew area in Girona in a real old style Jew house. Excellent situation to breathe history. Location is very good, right next to the cathedral. Bring ear plugs if you're a light sleeper and wake when you hear loud bells. For a Family of four, the price of the apartment was a good value. The beds were good. Other furnishings (tables, chaIrs, sofa, wall decoration) were old and of poor taste/quality. Think: Salvation Army. Extremely difficult/impossible to find if driving and not on foot. Almost everything. Great location and apartment. I would recommend a note at the gate of Casa Cundaro pointing to Hotel Historic since that is where you check in. El apartamento está ubicado en un edificio secular restaurado gon mucho cuidado. Nos ha gustado todo, las camas eran cómodas y la calefacción funcionaba bien. Sé notaba continuamente un ligero olor de humo de tabaco proveniente de otro piso. El microondas no funcionaba. La cas on són els apartaments és molt bonica i al ben mig de tot. Месторасположение- лучшего и представить сложно... В самом центре старого города. Мы были одни во всем здании. Это старый еврейский дом, вход в который начинается с общего патио. Дом настолько аутентичный, что так и ждешь приведений за углом )) При этом номер на четверых был огромный, с двумя спальнями и общей зоной. Все очень чисто и уютно. И что важно- тепло! Это не так часто встретишь зимой. Очень рекомендуем! L'indret on esta situat l'apartament al ben mig del call jueu i l catedral. La ubicación perfecta para visitar Girona. La habitación amplia y limpia, quizás el baño necesitaba algún retoque pero en general muy bien. Las campanas de las siete de la mañana, pero eso no depende del hotel. todo genial..un sitio bonito, con encanto , y la ubicacion excelente..
Das Hotel liegt direkt an der großen Treppe zur Kathedrale. In historischem Gemäuer moderne Einrichtung. L'entorn on es troben els apartaments és espectacular. És com fer un salt en el temps. Wonderful place (the location of the hotel, room)!!!! There were not enough wine glasses and dishes in kitchen. Отель расположен в самом центре старого города в старинном здании. Очень красивый интерьер, внутренний дворик и т.д. Заявлен как апартаменты, но нет даже посуды и микроволновки. Полное отсутствие звукоизоляции - ваши разговоры отлично слышно на улице. Väldigt speciellt hotell där man hade lyckats kombinera medeltidskänsla med komfort. The apartment is located in an old house in the historic centre just next to the cathedral. It's very well renovated and very confortable, with a pitoresque courtyard. We would definitely recommend it. A beautiful building in a magical part of the old town, right next door to Girona cathedral. the location, the attention to detail, the historic nature of the whole building. the courtyard garden and the tranquility within a busy city. Prachtige ligging. Karaktervol gebouw. Dank zij het personeel parking dichtbij. Lovely quaint apartment in an old Jewish house right beside the Cathedral. Location is fabulous right in the heart of the old town. Owner was very helpful and gave some really good recommendations for restaurants. Would recommend a visit! Facilities at apartment are very basic - not really suitable for cooking - perfect for sleeping in only. Great location though! Location was great, next to the cathedral. Big bathroom with a nice shower. There was no air conditioning, only a fan. It was not that hot, but air conditioning would have been better. Realmente me ha parecido un precio muy elevado para lo que ofrecia. Cama pequena sin aire acondicionado. Demasiadasas escaleras. El bano solo tenia un microjabon para los dos. Las fotos dan una vision engañosa.decoracion escasa. Lo peor son las campanadas de la catedral que se meten en la habitacion cada cuarto de hora y a las 7 de la maxrugada toca un repique para animar a los vecinos a una misa que no hay. Location was perfect. 2 mins from Girona Carhedral. Very private and relaxing. A few ants which joined us but that's what you expect in the height of Summer! La casa tiene un encanto especial. Es una casa antigua muy bien conservada. La ubicación. Te dejan una tarjeta para poder aparcar en el casco antiguo. Hace calor en la habitación y solo hay un ventilador que no sirve de mucho. The apartments are in the most amazing building, a short walk from the check in hotel, Historic Hotel. The owner told us a lot of the history of the building, which was so interesting. We were in the loft studio, up lots of flights of steps, not that that worried us. The studio was huge, with a small balcony, and lots of windows to open and admire the view to the Pyrenees in the distance. There was a kitchen with microwave, fridge. The building is right beside the cathedral, so the bells ring day and night, but as other's have said it adds to the atmosphere. There is a small inner garden you can sit in. The apartments are right in the centre of Girona old town, a perfect spot. Recommend you get a taxi from the bus or railway station if arriving that way, it's not easy pushing suitcases along narrow cobbled streets. Small problem was the keys to the apartment and the metal gate when you enter the building. It was explained that we needed to move the keys around a little in each lock to get them to work, well we did this, sometimes for quite a while to get the doors and gate to unlock - you have to be patient! Location, proximity to old town and walking distance to new. Amazing old building, would have liked to know history. Bit spartan in our room, 104. A couple of cushions and a picture on the wall would have made a difference. El estudio era muy amplio y precioso, con las paredes de piedra. La cocina está poco equipada, aunque tiene lo básico. We loved our room with a balcony looking out toward the cathedral in the old city. The room was clean and the bathroom spacious, bright and unique. We were traveling by bicycle. The staff secured a safe area to store them. It was challenging to locate Casa Cundaro, but once there the challenge was worth the effort! Läget är helt perfekt, mitt i gamla stan i Girona. Bra att det är en lägenhet så att man kan välja om man vill ordna sin egen mat. Underbart gammalt hus med mycket charm, helt prisvärt alternativ. El lloc és ideal perquè està al costat de la catedral, al vell mig del cas antic de Girona i al costat de tots els llocs que s'han de visitar. La casa és fantàstica, totes les habitacions amplies, cadascuna diferent però totes amb encant. The owner was amazing. He took his time to tell us about the amazing history of the house and was patient with our bad Spanish, switching to English whenever we didn't understand something. I really liked this since I'm very shy about speaking Spanish and slow to understand but I like the opportunity to try. The building our room was in was amazingly beautiful, the room was really original and the beds comfortable. A truly unique, highly enjoyable, high value for money experience. Would recommend this to everyone who comes to Girona. 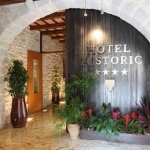 A really beautiful old building with comfortable beds and lovely bathroom with nice towels and bed linen. Our apartment overlooked a courtyard garden and so was quiet and peaceful with great views over the rooftops of Girona. The only minus (for me) was that there were no electrical appliances, such as a hairdryer, iron or kettle. Had we been staying for longer this would have been a disappointment, although we could probably have asked for them, as the hotel owners were very friendly and helpful. La recepcion está en otro hotel,n hay ascensor en el hotel y la habitación es una casa reformada,nuestra parte era el comedor convertido en una habitacion decorada no con buen gusto y la cocina que era el lavabo. Se conserva la pica y los muebles d la cocina y muy mal colocados estan el lavabo y la ducha. Xavi, the staff person who helped us was great. This hotel was just lovely...previously, it was a historic home in the Jewish Quarter of Girona. The room was stunning and clean, the bathroom was huge and I felt like I was in some kind of spa. It would have been nice to have a hair dryer. Since you can see the Cathedral from your room (actually quite nice in some ways) you also can hear the bells ringing on the hour, every hour, including while you are trying to sleep. Rumor has it there's a "white noise" app that would come in handy. It was a bit stressful trying to drive through the historic part of town and they do have regulations for how many times you can drive through there and whatnot (with hefty fines if you violate them). We ended up having a little bit of trouble parking and had to walk quite a ways from the hotel but since the weather was nice it wasn't too bad. Beautiful historical house in the heart of old town. Location is perfect. It was nice that owner told us best places to see and what to do in Girona. Apartment was spacious and clean with small balcony and garden view . Очень впечатляет. Окунаешся в атмосферу средневековой Героны. Даже в апартаментах. Нет ресторанов для семей с детьми. Really helpful staff, who were very reasonable when I explained that I had only intended to book 1 room, not 2!Beautiful historic building, with lovely clean bedroom, modern shower and pleasant kitchen/diner. Great position for exploring the old town. Utensilios de cocina muy limitados. Dificultad de accesso a la casa, puesto que se debe entrar dentro del casco antiguo y sin información previa es difícil de encontrar dado que hay señales de controles fotográficos y no sabes si puedes pasar o no. Ubicación, trato personal, habitación amplia, tranquilidad. Check in en otro hotel, mobiliario de la habitación algo desfasado, jardín interior de la casa poco utilizable. Nette locatie, voor een nette prijs. Locatie aan de voet van de indrukwekkende kathedraal en historisch centrum. We loved the way Casa Cundaro was built into the old city of Girona. Very comfortable apartment in an interesting location.